A menubar app that shows keyboard shortcuts based on your current app. 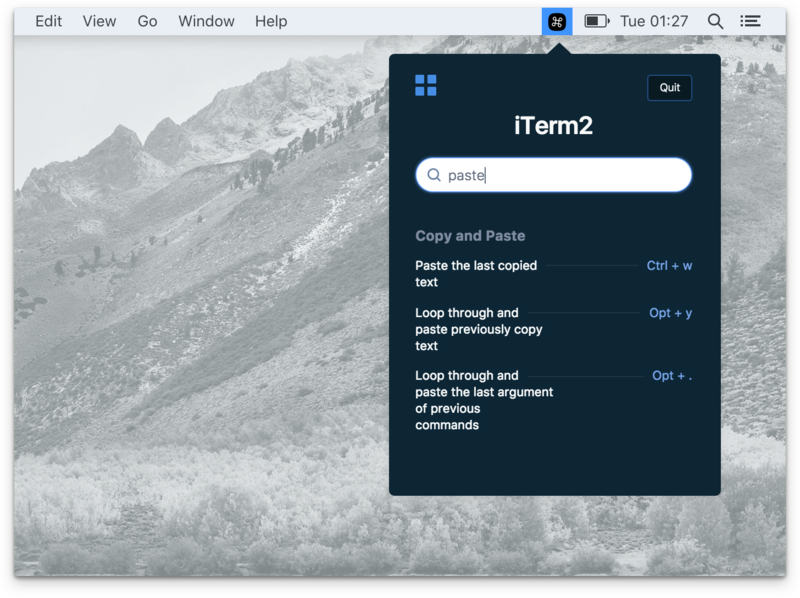 Pretzel is Mac desktop app that shows and search keyboard shortcuts based on your current app. Checkout the landing page here.  In-App quick search: Find your specific shortcut with quick search among hundreds. ⚡ Detects the currently focused app.  Little distraction from your current task. Clicking on the menubar icon or hit CmdorCtrl + (backtick) on keyboard will automatically opens the shortcut panel. Because Pretzel has a dependency node-ffi that requires node v8, until node-ffi is compaitable with latest node, you should use nvm to install node v8 to run Pretzel locally. Otherwise, npm install would give you some error regarding node-gyp. Create a text file with .yml as the file name. For example, Photoshop.yml. Find your app&apos;s shortcuts on the web and add them to your .yml file, in the same format as the files in /shortcuts folder. Send me the .yml file so I could add it in.